We recommend salt lemon this spring! It is made of organic lemon and Okinawan mild natural salt, and it is slowly fermented for a month. The salmon and the chicken is marinated in this salt lemon and is baked throughly. Lemon gives the whole dish it’s refreshing flavor. You can only find this bamboo shoots rice during spring at Nijiya. It has a Gentle taste with additive-free bonito broth. It is mixed with seaweed and it helps to keep beautiful skin and hair. 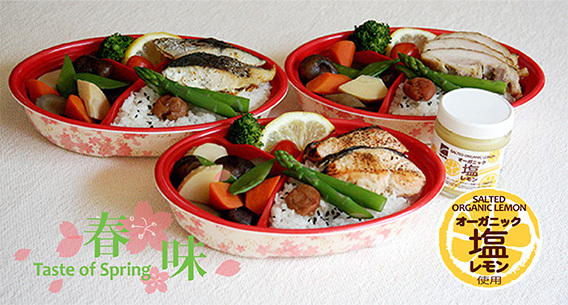 Many colorful ingredients On top o sushi rice, to make it look like a spring flower garden.